Last time around I noted that I had a bit on. With the Middle Harbour Yacht Clubs Short Ocean racing Championships last weekend, we had 4 divisions racing with boats such as the new McConaghy38 Ginger and Rob Hannas Shogun TP52 team up form Victoria and a range of Sydney and Pittwater locals. Saturday saw a race up to Lion Island and back in a lovely Noreaster, Shogun did the return in 4 hours 5 mins and 55 seconds. Some of the smaller boats would have been just reaching Broken Bay! Truely amazing given the breeze never really got over 14knots. Sunday saw a planned 2 races cut to one due to the light conditions. I had to postpone the start as there was no breeze to get them out of the harbour, then 3 of the 4 divisions were too keen on the start line so we had a couple of individual recalls in each, hastened by a runout tide. With the lack of breeze offshore the first race was shortened, we had planned for two but the wind didn’t play nice, so it was called for the weekend at that. For the next week and a bit, I’ll be in Victoria officating at Sail Melbourne, part of ISAFs World Cup series. Over 300 competitors at Sandringham Yacht Club competing in a range of classes on four courses. Needless to say I have a range of DeckHardware products, should any competitor require assistance. The van is packed, jam packed as I’m also assisting Krystal Weir, Australia’s London 2012 Laser Radial sailor by taking down her boat and some of her gear. Krystal has only sailed the laser a couple of times since the Olympics in a little break/ respite form competition. This event is the first in an effort to gain selection for Rio 2016. Bit on at this time of year. At this time of year there’s always a bit on. Saturday before last was round two of the State Kiteboarding championships that I’ve been running, this coming Saturday will see round three at Botany Bay . As of last week ISAF have decided against an earlier decision to instate the Kites for Rio 2016 instead of Sailboards. They have now reversed this decision and the Kites are out. It will be interesting to see how many continue racing in the long term. The next day saw a little trip up to the Central Coast for the BIA Try Sailing day. 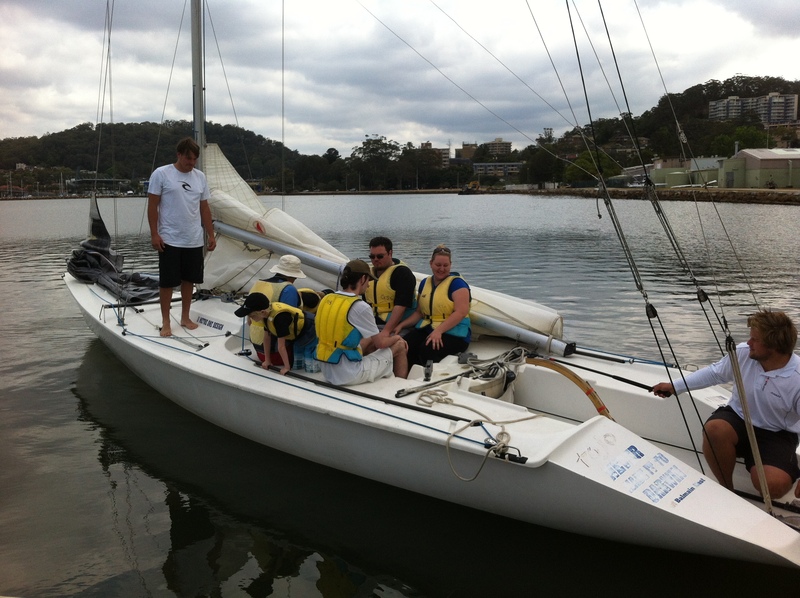 I visited Gosford Sailing Club, Budgewoi Sailing Club, South Lake Macquarie Sailing club at Sunshine and Mannering Park Sailing Club. It was good to see the volunteers helping out and assisting those who would like to take up the sport of Sailing – well done. At Sunshine they had over 60 turn up, only a couple had pre registered so well done to all there. The photo shows an 11m One design taking those out at Gosford. Thursday was another one of my little drives down to the South Coast of NSW. I stopped and saw customers at Lake Illawarra, Nowra, Wollamia, Ulladulla and Batemans Bay. A long day on the road and 625 kms driven. The photo shows an IOR Robber 1/4 tonner at Wollamia. 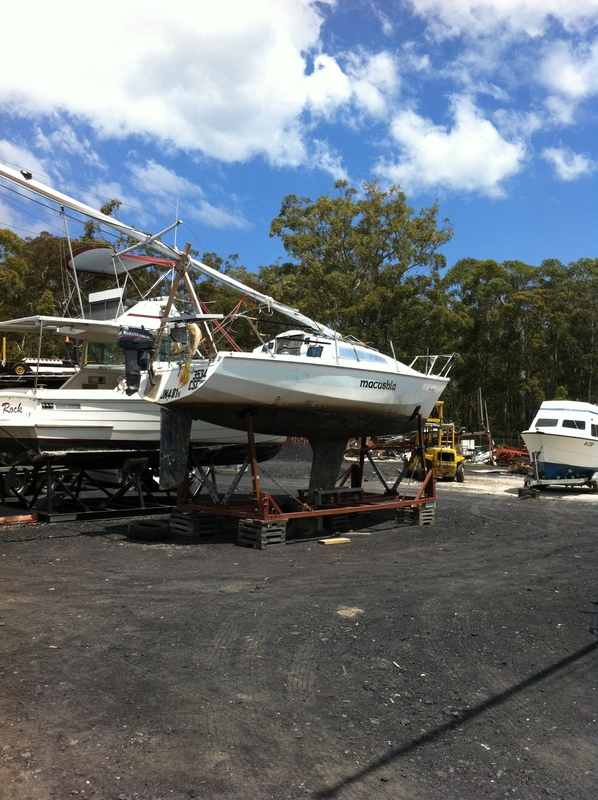 This yard is full of owner builder/repairers, where they can pull their boats and take their time updating. Back in the 70s, my late father had the plans to build one and engaged Ken Beashel to price it up. Unfortunately it never went ahead. They were a quick boat in their day in Europe, although none of the Australian built boats had any success that I know of. Saturday saw me back at MHYC for the first time in several weeks running the club races. With 20knots at the start there was plenty of action on the water. Yesterday was a rare day away from the water. We have several friends who are due to have babies in the coming weeks, so there was a bit of a get together and a catchup. Very enjoyable day cathing up with old friends. Next Saturday sees me back at Botany Bay for round three of the Kiteboards and Sunday a trip up to the lake for the first day of racing in the Australian Multihull Championships. This is a look/see, as I’m not involved in the race management. The following weekend is the MHYC Short Ocean Racing Championships, Saturday is a race up to Lion Island at Broken Bay. Sunday sees two short races offshore. Depending on the forecast, I’ll either send them North to the Manly Circle or south to Bondi. Following that, I’m off to Melbourne where I’ll be involved in running Sail Melbourne. This is the first time I’ll be involved in Sail Melbourne, but an interesting look at how others run their events none the less. With the amount of yacht race management I do, it’ll be interesting doing dinghies. Suddenly Christmas is upon us and it’s time for the Rolex Sydney Hobart start, where I’m the RO for the Southern line. This will be the sixth year and it never gets any easier. Each time I go to anchor in the designated spot there’s a hole making holding fast difficult, some how we do it. Last year we had a couple of OCS starters which meant no going out to watch them turn south. Hopefully this year they’ll all behave. Thats’ the weekends booked till the New Year, like I said a bit on. January? Off to Tasmania with the DeckHardware van on the ferry. Mels going down with it for a couple of weeks, I’ll bring it back.